I was planning on doing a review on the Maybelline Dream Bouncy Blush today and had my blog post all ready to go…and then I remembered I forgot to take a swatch photo. Derp! Neal usually helps me with my swatch photos (oh, how I wish I had 3 arms), so I’ll load the review blog post on Monday. Big thank you to Lily for tagging me in this ‘Would You Rather Tag’. Check out Lily’s answers here. As with all my other tags, I won’t be tagging anyone specific because I’ve noticed some bloggers aren’t into the whole tag blog post thing. 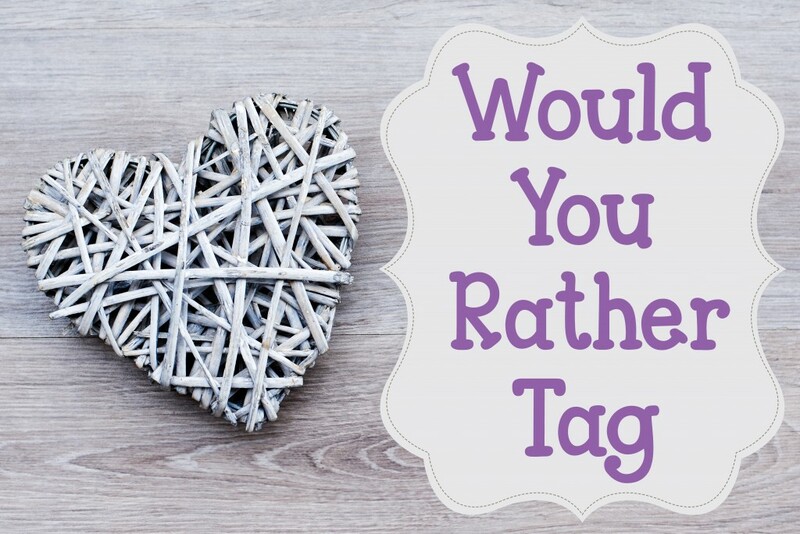 But if you would like to do this tag post, then I tag YOU! Would you rather lose all of your mascaras, eyeliners, lipsticks, and lipglosses or lose all of your palettes and eyeshadows? I would rather lose all my eyeshadows and palettes as you can always use eyeliners (smudged out) as a type of eyeshadow. Tough one… I’m really struggling to grow my hair long at the moment, it kind of feels like it gets to a certain point and then just doesn’t want to grow further. BUT. I can’t imagine not being able to cut my hair ever again because I don’t like how it looks when someone has super long hair and the ends are dry, split and well…gross. *thinks* I would rather chop it off and then grow it out. Coral cheek, it suits my skin tone a bit better. If you had R 10 000 to spend, would you rather buy clothes or makeup? I own an awful lot of makeup, probably way too much for most people (although I don’t think I could ever own too much). I think clothes are worth the investment so I’d probably spend it on clothes. But if I didn’t own as much makeup as I do now, then I’d probably spend it on some wonderful makeup. Ok, who am I kidding!? I’d spend like R 3 000 on some luxurious makeup like something from YSL, Bobbi Brown or Chanel and the rest on clothes. I think an eyeliner as lipstick would be extremely uncomfortable on the lips (and I don’t think I would rock a black / brown / purple lip)! As most lipsticks are somewhat moisturising and pigmented I would probably rather apply a lipstick as eyeliner. And for a longer-lasting eyeliner, one can always use a matte lipstick. Would you rather only shop at MAC or Edgars? I love MAC and I think (for the most part) it’s an amazing all-rounder brand but Edgars sells MAC amongst many other makeup brands so I’d rather only shop there. You gotta be smart about these things – haha! Would you rather only use one eyeshadow colour or one lip colour for the rest of your life? I tend to stick to similar shades of lipsticks, so I would probably choose to only have 1 shade of lipstick for the rest of my life. I would rather wear Summer clothes in winter and layer them to keep warm. I can’t stand being too hot, I find it a lot more uncomfortable than being cold. Bright nails! It definitely brightens my mood. Would you rather give up your favourite lip product or your favourite eye product? To be honest, I would give up either of them. There are sooooo many dupes out there at the moment, for lipsticks and eyeshadows. I don’t think there is one shade in the world, that doesn’t have a dupe. Probably a ponytail because then one could really see the length of your hair. Plus one could always do a fishtail braid, normal braid etc. if it’s in a pony tail (is that cheating?). Another tough one! For years I never really used to wear nail polish, I always just kept my nails short and plain. But now with all the nail polishes I own and the nail art I’ve seen, I can’t imagine never painting my nails again. I would rather not use lipgloss because there’s always lipstick (sneaky-sneaky) and if you want to get technical, then I’ll just use a lipbalm. I lurv these tag posts, Luzanne. Wish I was a blogger so that I could do them too lol. Those are tough questions especially the ones related to brows and hair . Lol. How these tag posts work? Most difficult questions ever! I could never choose between makeup, polish or lipgloss! I stressed myself out while doing this tag…dramatic much? You, on the other hand, are so calm and collected. I guess I think about it too much!! I really enjoyed this tag, very different than most!! Glad you did it, Luzanne! I try not to think that I might REALLY have to make these decisions one day… If I ever had to, I would just refuse to choose – haha! Hey Luzanne, I would love to participate in this tag… I love makeup and nailpolish, Mascara OMG its hilarious. Love post and great answers. I’d rather spend R10 000 on clothing than make-up BUT I definitely can’t live without make-up at my age, ha-ha! Love this post and tag. Loved your answers. Some really difficult questions in there!